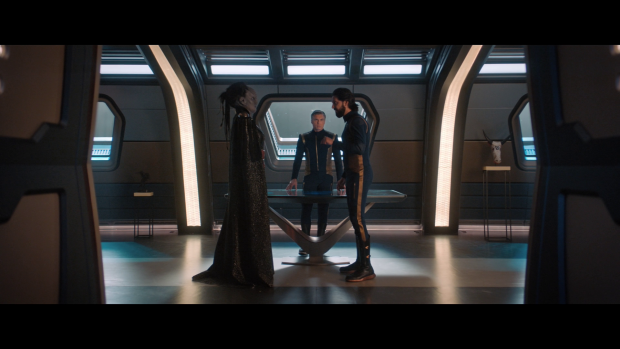 Star Trek: Discovery continues with the threat to the galaxy plot with the investigation of two leads that may provide answers for them. The previous episode was an intense character driven emotional journey which means that this episode is about picking up the pieces of that. Michael Burnham begins this episode angry which manifests as clear impatience for the lack of answers they currently have as well as a desire for revenge. Her current belief is that they should be working with Georgiou to track down the Control possessed Leland because she clearly wants to make him pay for the role he played in her mother being lost to her once again. In many ways it’s worse for Burnham to know that her mother is out there alive and can’t be reached. Sonequa Martin-Green sells the anger, frustration and helplessness wonderfully. Amanda makes a brief appearance to give her emotional support at a time where she desperately needs it. Her scene with Amanda is the only time that Burnham lets her walls down to show her vulnerability and it’s a quietly beautiful moment that punctuates how difficult it is for her to resolve her complex feelings on the current situation. Spock appearing right at the end of that scene provides a brief but poignant family moment that ends with Amanda asking her children to take care of each other. Moments like this make the family dynamic feel more tangible and imply that history we otherwise wouldn’t get to see much of. The past few episodes have certainly proven that Spock and Burnham make for an engaging team so it’s fortunate that this episode brings us more of that. Spock showing up just as she is about to leave on her shuttle mission pointing out that it would be illogical for her to embark on this mission alone because it opens her up to unnecessary risk especially with it currently being an impossibility. Burnham is resistant to Spock joining her on this mission as she clearly wants to be alone while also needing to do something productive with her time. She sees tracking down Control as being a productive course of action and she also sees it as her mission because she is looking for some form of revenge. Spock likely realises that and forces himself onto the mission which results in a perfectly delivered frustrated grunt from Burnham that perfectly encapsulates the brother/sister dynamic as only a sibling could get under someone’s skin in that way. Burnham and Spock have a chance to reflect on recent events en route to their destination. The mystery surrounding the signals is foremost on Spock’s mind as he doesn’t yet have a constructive theory as to what they mean but seems sure that another time traveling entity is behind them. He sees Burnham as the common denominator considering the nature of their previous appearance so thinks that the answer will involve her in some way. Burnham doesn’t agree as she doesn’t subscribe to the notion that she is in any way important when it comes to the current situation despite the Red Angel turning out to be her mother. All she wants to do is solve the crisis and not have everything revolve around her which almost acts as a commentary on the criticisms lobbied at this show for its focus on Michael Burnham. Spock once again shows impressive emotional insight when he points out that Burnham is angry as a result of recent events. He understands this because she feels exactly how he felt not so long ago so he’s in a good position to warn her against the pitfalls of letting that consume her. He dispassionately.points out that it is the enemy of logic and encourages her to try to push it aside in order to clear her mind to deal with the mission at hand. Burnham is able to admit they she’s enraged. It isn’t willing to let go of it at this point. Gaining that perspective is her arc for the episode and this conversation sets that up. It’s a great scene that further exemplifies how great these characters are together. The investigation of the Section 31 ship that has failed to check in works really well. It begins with the chilling image of the bodies floating through space as the ship lies dormant nearby. It sets up the ship itself as a silent antagonist that can’t be trusted and the dead bodies serve as an example of how little Control values organic life while establishing a potential fate for Spock and Burnham. It’s a very clear way to establish the threat that they are about to face. 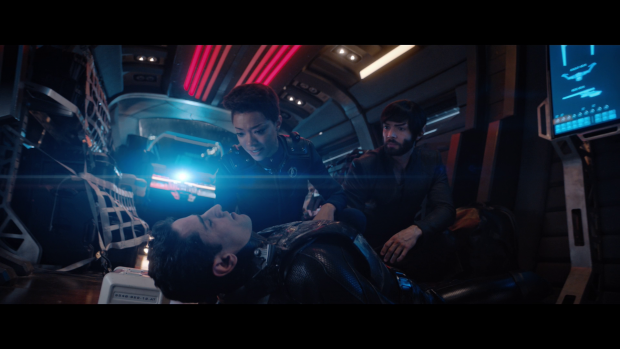 Spock and Burnham beam over a survivor in an EV suit who turns out to be Kamran Gant (Ali Momen); someone who used to serve on the Shenzhou when Burnham was the first officer. He is being controlled by the A.I. in the same way Leland was though that isn’t immediately made clear. Gant comes across as lot more convincingly than Leland did. The biggest difference is his ability to emote which makes him able to convince Burnham that he’s full of guilt and regret. It’s a natural way to elicit empathy and it works well enough to allow the A.I. to lull her into a false sense of security before attempting to take her over so that it can gain access to the data it seeks. This makes for an engaging reveal that provides an excuse for a really creative action sequence involving Burnham handling the fire fight while Spock works on a technical solution. Burnham’s desperation to make up for the mistake of trusting him comes across brilliantly and adds to the tension in a really tangible way as if she is almost punishing herself for letting her guard down. I’m still largely confused about Control’s motivations as they don’t really make a lot of sense. It has been established that the A.I. was created along the lines of Section 31’s mission statement. This means that it’s primary purpose was to find ways of maintaining a stable climate so that the Federation would be safe. From a certain point of view the destruction of all organic life in the galaxy could be seen as a way of maintaining stability as there are no races to make War with one another though it doesn’t actually create a stable Federation since that would also be destroyed unless the Federation is an abstract concept that doesn’t actually need people to be in it in order to exist. That’s a much larger debate and the show doesn’t seem to be all that interested in having it. For now the A.I. is very much along the lines of doing everything it can to achieve sentience without worrying about who or what gets in its way and has a long term plan of destroying all sentient life in the galaxy. It’s a very maniacal plan that is certainly high stakes but doesn’t feel entirely justified at this point. The whole purpose of this particular part of its plan was to get close enough to Burnham to take over her so that it can have access to the sphere data. Meticulously calculating how she might react to certain situations before engineering scenarios to put her in those situations is in theory an ingenious idea but it starts to fall apart when considering why it needs to be Burnham. 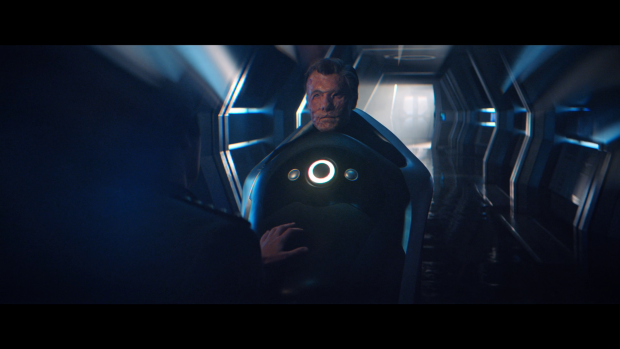 Control could simply look to take over any member of Discovery’s crew and gain the same access to the ship’s systems. Of course Burnham is the main character and therefore has to take focus most of the time but the writers seem to be bending over backwards to make that happen rather than allowing it to come across organically. Captain Pike leads the secondary plot that begins when a signal appears over Boreth -the Klingon Monastery mentioned in an earlier episode– and Discovery heads there to investigate why they are being led to that particular location. If they can get a hold of one of the time crystals that are found there then it will grant them the ability to send the sphere data into the far future free from the reach of Control. It should also allow them to help Dr. Burnham who is stuck in that future time period with no current possibility of rescue. Basically it allows them to recoup the losses from the previous episode and resume that particular plan. There are a few catches to this plan such as the Klingons in the Monastery not being all that welcoming of outsiders. It’s basically the spiritual backbone of the Klingon Empire so it makes sense that they are less than welcoming to those who don’t understand the spiritual aspect of their culture. 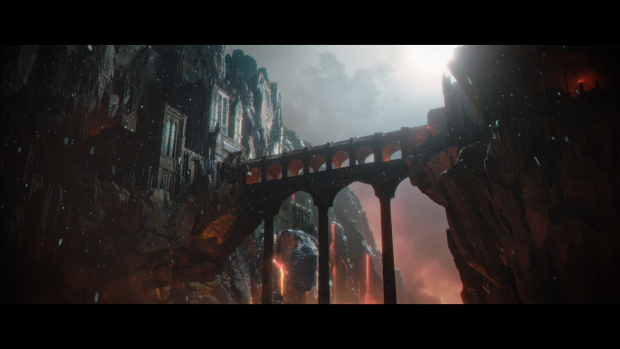 This makes access a problem which prompts Tyler to contact L’Rell so that Discovery can have permission to access the Monastery and state their case directly. Your mileage on this will vary depending on how engaged you were with the Tyler/L’Rell subplot involving their child that was secretly stashed away in this Monastery to keep it safe while preserving L’Rell’s authority as Chancellor. This thread is picked up in order to offer closure on their shared choice as well as their relationship. They have a really open and frank discussion where L’Rell tells Tyler that she has come to the realisation that their relationship was never going to work because Tyler isn’t the man she loved. L’Rell loved Voq and that man no longer exists no matter how much Tyler reminds her of him. She has also accepted that Tyler is in love with Burnham so she basically releases him from his obligation to her because she has no doubt that Tyler would do anything to protect their son and that is more than enough for her. This frames any future interactions that they may have through the lens of mutual respect and closure which feels about right at this point. Their son has aged at an accelerated rate thanks to his proximity to the time crystals. This ends up adding to the Tyler/L’Rell closure as he has found a place to belong in the universe thanks to them giving him the opportunity by sending him to the Monastery. He returns the insignia of the Torchbearer as a sign that he is grateful for the opportunity given to him by his parents. 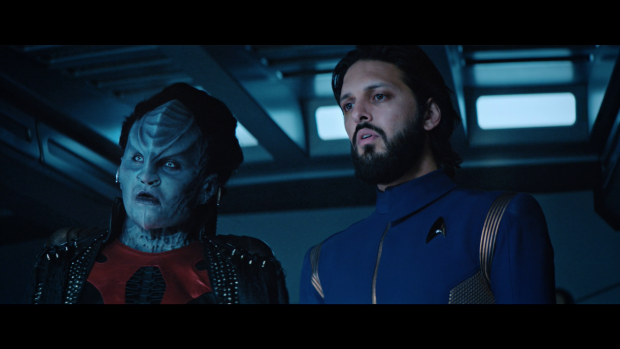 It’s a moving moment of realisation that is really well played by Shazad Latif and Mary Chieffo who both display a complex array of emotions that turn this insane situation into something a lot more grounded. Even though fast ageing children due to temporal intervention isn’t something likely to happen in the lives of any viewer it is still possible to understand the idea of giving up a child and then receiving confirmation that it was the best decision for their own well being. It’s exactly what each of them needed to hear and solidifies the choices they made. This ends up being an unexpectedly revelatory episode for Pike who has to make a very difficult choice in order to prove himself worthy of a time crystal. He is to be shown his future and choose between embracing it or running away from it. Naturally running from it will mean that he doesn’t gain possession of a time crystal so it turns a MacGuffin hunt into a very personal decision for Pike. The future he is shown is the one that fans of the franchise will be familiar with. First he is shown the accident that results in him being put in the famous chair where he can only express himself with a yes or a no in the form of beeps. 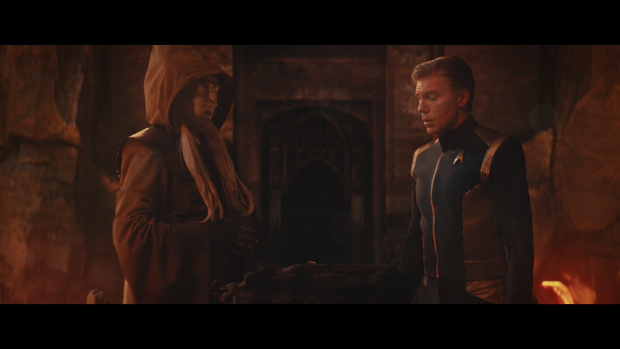 The visual of Pike face to face with his disfigured future self is really chilling and Anson Mount’s performance perfectly sells the sheer horror of Pike’s reaction to what he will become. It’s fair to say that the chair has become so famous because it’s more than a little cheesy. This show walks that line nicely with a slight visual upgrade combined with the unsettling laboured breathing that shows how painful an existence Pike is destined to endure. Despite knowing how he will end up Pike chooses to embrace this less than ideal future despite it being far from what he wanted for himself. As with every decision he makes he comes back to his core principles and remembers exactly why he became a Starfleet Officer in the first place. He places his hand over his badge as a reaffirmation of those values and says “You believe in service, sacrifice, compassion and love”. The word sacrifice resonates most clearly as he is choosing to sacrifice his own future to save countless others. Knowing the future doesn’t stop him from being true to himself and he proves worthy of the crystal. It’s unclear how Pike will be affected by this knowledge in the coming episodes in terms of his general mood but I fully expect him to continue to conduct himself with grace and professionalism as he always does. The rift between Stamets and Culber is still hindering Stamets’ ability to concentrate and Reno is the one who has noticed it more than anyone else. Stamets sitting silently in the mess hall as his colleagues are having a good time around him is a strong example of how distanced Stamets feels at this point in his life as he contemplates all that he has lost. Reno isn’t the sort of person to sugarcoat anything so she takes it upon herself to attempt to fix this. She talks to Culber about her late wife and all the things she did that drove her crazy. It’s delivered with so much affection to make it clear that those were the things that she loved most. Culber responds by affectionately pointing out the irritating things about Stamets that he loves and they bond over embracing the differences in their relationships. The key difference is that Reno has lost her wife whereas Culber has a second chance with Stamets that she encourages him not to waste. Arguably this isn’t her place but her blunt approach is really entertaining to watch and establishes an engaging dynamic to be revisited. A really exciting cliffhanger closes out the episode. A large number of Section 31 ships converge on Discovery’s position which leaves little choice but to destroy the ship in order to prevent the sphere data from falling into the hands of Control. I don’t believe for a second this will happen but the situation is filled with a palpable sense of urgency as the whole crew appear terrified of what they are about to face. Pike orders the Enterprise to be contacted to serve as backup for the coming engagement which really gets my attention as it looks like this show is about to deliver the full scale Discovery/Enterprise team-up that I really want to see. An excellent episode that continues to keep the larger than life plots grounded in powerful character drama. Burnham and Spock working together after being asked to look after one another by Amanda works really well with Spock serving as the bringer of perspective to help Burnham deal with her increasing anger because of recent events. There are a lot of great moments between them in the episode that reinforce how compelling their unique relationship is. Burnham being fooled by Control taking over someone from her past works really well because it’s easy to see that she would be disarmed by Control throwing her off guard by eliciting empathy. The resulting action sequence where Burnham handles the fire fight and Spock comes up with a technical solution is appropriately tense and expertly executed. Control’s motivations are still poorly developed which makes it difficult to accept it as the antagonist it’s supposed to be but the character drama happening around it is strong enough to mitigate much of that. L’Rell and Tyler gaining closure on their relationship as well as their decision to send their son away to be secretly raised by monks is really strong though your mileage will vary depending on how invested you were in this plot earlier in the season. As a resolution to that it’s great because it allows L’Rell and Tyler to experience a complex collection of emotions that help ground the insanity of the situation in something relatable. Pike witnessing his future and choosing to reaffirm his core values in acceptance of that so that the galaxy has a chance to survive is a really powerful moment brilliantly acted by Anson Mount. Seeing him face to face with his own future is chilling and really effective. Reno involving herself in the Stamets/Culber rift works really well as it helps Culber realise what he misses about Stamets while also establishing a natural back and forth between her and Culber based on the similarities in their relationships. The cliffhanger ending involving a significant engagement with promise of backup from the Enterprise is really exciting while building a palpable sense of urgency.